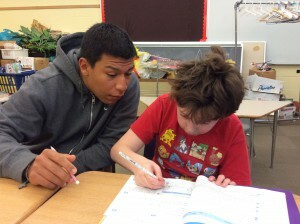 Paid job working at Williamstown Elementary School in one-on-one or small-group tutoring of local elementary students. Tutors develop a close mentoring relationship with children in need of support and assistance, or just someone to help them out with their homework. Tutors work with the same student every week so both the student and tutor will develop a close relationship. All tutoring takes place at Williamstown Elementary, which is within walking distance of the College (approximately 5 to 10 minutes), under the supervision of a teacher. No prior experience necessary, but certainly appreciated! To hear from current tutors about their experience, email student leaders Megan Siedman & Sylvia Janda.